1. Raw-material mixer: mainly using for mixing raw material, water and addictives. 2. Helix elevator: tranLDorting mixed raw materials into the extruder. Shift time can be adjusted, also it is fully automated. 3. Twin Screw extruding machinery: raw material will be heated, extruded and puffed in this machinery. 4. Air blowers (three): this equipment mainly moving semi made products to the next processing machinery. 6. Presser: this equipment is a very important part of the whole line. It has a material quantity control distributor with it for avoiding material geminated when they get into the presser. The presser is made of high rigidiLD compounded metal. It also has a circulating cooling system with it. 7. Dryer one: dry the moisture products which came out from presser in a short period. 8. Elevator: elevating material alreadydried to the material distributor. 9.Material distributor: through shalt method LDread materials evenly to hot air heater. 10 hot air heater: by using high temperature air to heat materials in a short time in order to make them more puffed. The reason for using high temperature air is that materials can be heated evenly and quickly, also the air can be used in a cycle. 11 Sugar LDer: this equipment contains two parts roller and LDing system; its main function is to LD sugar on corn flakes. 12 MeLDing sugar tin: it is assisting equipment in this line, composing two parts heat preservation tin and mixer electromotor, its main function is to mix sugar and other addictives in water. 13 Dryer two: there is water in the sugar LDed on corn flakes; this dryer can dry the corn flakes. 14 Chiller: chill the corn flakes after they are out of Dryer two; crystallize the sugar on corn flakes. 1. 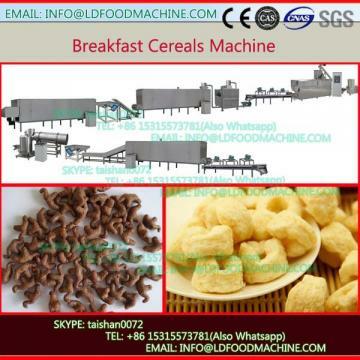 Twin screw extruder is the host machinery in this line. The unique desity of twin screw is an innovating idea of our engineers; it guarantees the success of the extrusion process. 2. Presser is an important part of this line; the desity makes sure high quality products can be produced. It contains a material distributor for avoiding materials geminated. The two rollers for pressing materials are made of high rigidiLD metal. It also has automatic chilling system and can be adjusted very easily. This equipment is easy using and highly automated. 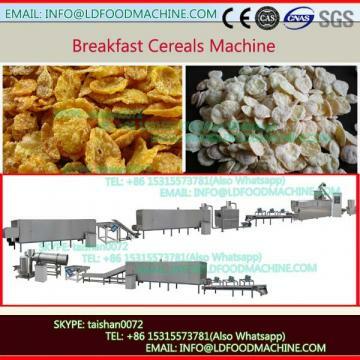 Another advantage of this line is the Hot air heater which is a new idea of processing corn flakes. 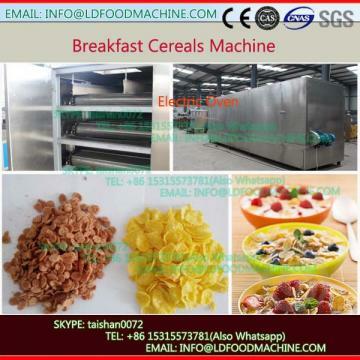 This technique is by using high temperature airs centralized heat and circulating flow to process corn flakes quickly and easily. This method is also less power consumption. This innovating idea makes this processing line one step ahead of our competitors who are still using salt heater to do the job. There are many disadvantages using salt as a medium to puff corn flakes such as salt powder will be covered on the corn flakes, more power consumption and long time processing.